This Bank Holiday Weekend (Saturday 5th - Monday 7th May) our home patch of Little Venice will be taken over by a dazzling display of narrow boats from across the UK as part of the annual Canalway Cavalcade. Thousands of visitors arrive each day to see this celebration of canal culture & heritage, take part in hundreds of different family activities, shop at the myriad stalls along the towpaths and feast on a delicious array of food and drink. Never one to pass up an invitation to a party, the Floating Classroom will be open from 11am – 5.30pm throughout the 3 day the festival. Our teacher – Bug Man Tim – will be running 3 shows a day on the boat in which children and parents can meet and learn about his incredible menagerie of insects, reptiles and arachnids. He’s the star of Cavalcade and the shows are incredibly popular so if you would like to meet Delilah the snake or Elvis the chameleon pop in to buy tickets. In between the shows children can join us to make badges, practise their artistic skills and perhaps manufacture their own scented bath bombs. If we can face the clean-up operation afterwards! To fuel all of this activity – and to bring relief to fatigued parents – we’ll be selling juices, soft drinks, teas, coffees and an indecent amount of gluten-free goodies which have to be tasted to be believed. 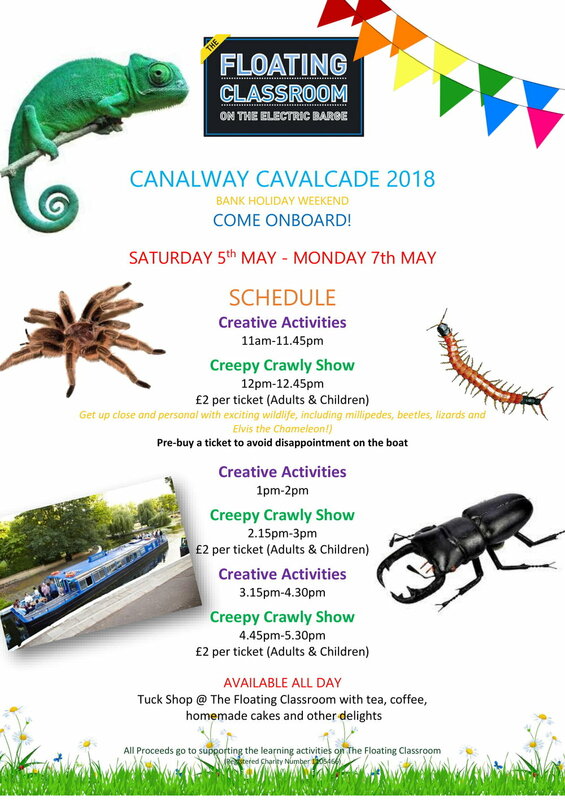 We hope this has whetted your appetite for coming along to Canalway Cavalace. We would love to see you on board the Floating Classroom over the weekend. Cavalcade is organised by the Inland Waterways Association, a charity that campaigns to protect and restore the inland waterways of England and Wales. It is a membership organisation that depends on energy, commitment and passion of volunteers to undertake this vital heritage conservation work.